I am quite sure that you all had your fair share of laughter from ‘The Oga at the Top’ video and the several spin-offs that came thereafter. Lackadaisical attitude to work. People just don’t care; or how would you explain the Commandant’s inability to give a complete website address? 2. People are not empowered to take decisions or use their intuition, if you recall, the commandant feared to disclose a wrong website so that his Oga at the Top won’t disclose something else. 4. Computers are a ‘wonder’, most civil servants have no clue about where the power button of a computer is located let alone operating one to generate a report – like you and I do on a daily basis. What they tend to do is to have a computer room with two computer-literate personnel who churn out all the required documents. Think about NIPOST, PHCN, Police stations, the FRSC, LASTMA, NDLEA and more. In how many of these places have you seen a computer? These are a few government agencies and parastals that I have interacted with and the story is the same. 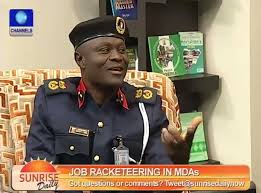 It is sad that Commandment turned the scapegoat and is now on suspension, but it would surprise you that the “Oga at the Top” doesn’t know how to operate a computer or the nscdc website.